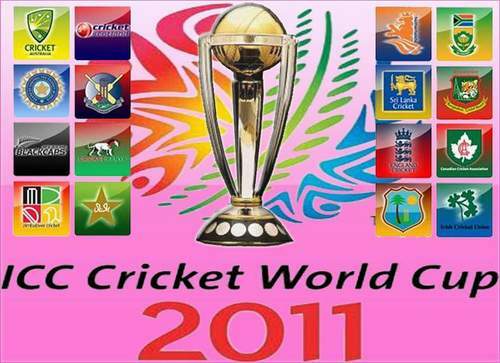 Watch ICC cricket world cup 2011 online free , 100% working links. This 2011 World Cup will see 14 teams instead of the regular 12. The first round of the ICC World Cup 2010 are divided into 2 groups of 7 teams each. The 7 teams will play each other once and the top 4 from each group will quality for the quarter-finals. The quarter finals will be followed by the Semi-finals in India and Sri Lanka and the ICC World Cup final to be held at Wankhede Stadium in Mumbai, India. The 14 teams which will play in ICC World Cup 2011 include India, Sri Lanka, Bangladesh, Pakistan, Australia, England, New Zealand, West Indies, South Africa, Kenya, Zimbabwe, Canada, Ireland and Netherlands. The ICC World Cup 2011 will be broadcast live on ESPN Star Sports and Star Cricket. However, you can also catch up on live action from the tournament on ESPN3.com. If you need alternative ways to watch the ICC World Cup 2011 online, you can try out Crictime.com or Cricfire.com..